Following the release of her debut book, “The Way of Achievers,” author Maitha J. Al Shamsi returns to the publishing scene with “The Trader’s Guide” (published by Partridge Singapore). This guidebook provides a clear instruction and practical way to trade in the financial market successfully and profitably. “Over the years, I have seen people attempt to trade in the market but they fail because they learn from Market educator or brokers who does not have trading experience. These Market educators were having different agenda than the trader and gives wrong information about how to trade the market, which leaves the traders confused and having wrong experience from the market as they continue losing money in the market,” the author shares. As a proprietary trader and senior corporate banker, Al Shamsi offers a step-by-step guide on how to generate consistent income from trading forex, commodities and indices markets — the proprietary trader’s way. “The Trader’s Guide” is an educational book on trading the financial market discussing about theory of trading, developing a trading plan and strategy and executing trades. It is written in a simpler manner to help beginners and learning traders navigate their way to successful trading. 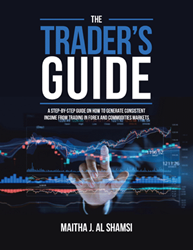 To purchase a copy and learn about the successful trading business, visit https://www.amazon.com/Trader’s-Guide-Step-step-Commodities/dp/1543749224. Maitha J. Al Shamsi, author, trader, trainer and entrepreneur from United Arab Emirates, has created several businesses both online and offline. In addition to her career as a proprietary trader and senior corporate banker, she is the author of the book “The Way of Achievers” and “The Trader's Guide.” She holds a Master of Business Administration from University of Wales. With her experience of over 15 years in corporate banking, trade finance and the global market, she has continuously helped her clients achieve their desired financial growth. Since her life mission is to inspire and encourage others to live the life of achievers full of abundance and fulfillment by creating an inspiring environment, she now mentors and coaches people on how to reach their goals in simple and effective ways, and helps others to succeed in business and financial trading using her unique strategies.